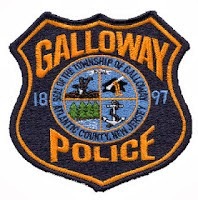 Galloway Township Police responded to 679 calls for service during March 2, 2014 through March 8, 2014. Additional statistics include: 1 Burglaries, 18 Motor Vehicle Accidents, 23 Tickets issued, 1 Driving While Intoxicated, 23 Arrests, 11 Domestic Violence,13 Fire Calls, 84 EMS Calls and 0 Juvenile call. Marie L Oquendo II, 27, of Mays Landing was arrested for DWI by Ofc. Gorneau on March 2. Axel V Braun, 20, of Galloway, was arrested for theft on 3/3 and 3/7. Shiffon M Jones, 33, of Jamaica, NY was arrested for hindering apprehension by Ofc. Baerman on March 3rd. Gregory P Dunn, 37, of Galloway was arrested for burglary, theft, and unlawful possession of weapon by Det. Casey on March 5. Eugene J Moffa Jr, 41, of Galloway was arrested for possession of CDS, possession of drug paraphernalia, and assault by Ofc. Crocker on March 5. Brandon K Baker, 18, of Galloway was arrested for possession of less than 50 grams of marijuana and possession of drug paraphernalia by Ofc. Worth on March 6. Alexis S Michel, 22, of Manahawkin was arrested for possession of CDS by Ofc. Crocker on March 6. John C Bailey Jr, 27, of Bayville was arrested for possession of CDS by Det. Latoracca on March 6. John D Harvey Jr, 21, of Galloway was arrested for robbery and conspiracy to commit robbery by Det. Casey on March 7. Abdul Parker, 43, of Galloway was arrested for robbery, conspiracy, possession of a weapon for unlawful purposes, unlawful possession of weapon and theft by Det. Casey on March 8.